LTE iPad mini pre-orders have started arriving this week in Canada, and now Apple retail stores are finally selling the cellular versions. 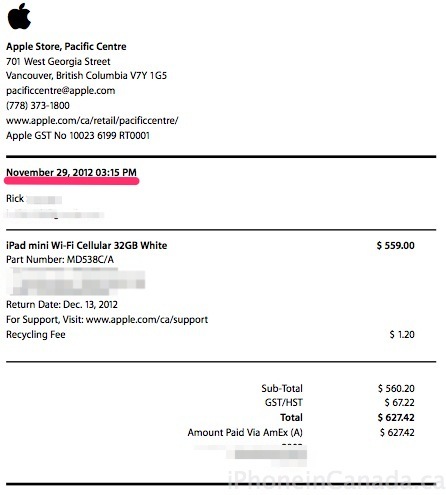 This was confirmed by iPhone in Canada reader Rick, who was able to purchase an LTE iPad mini yesterday from the Pacific Centre Apple Store in Vancouver. Calls to the store have confirmed LTE models are now available as of today, whereas yesterday we were told the ETA was ‘unknown’. The start of LTE iPad mini sales in store have coincided with the availability of unlocked iPhone 5 units and the new 21.5-inch iMac. Apple has geared up for the holiday rush as they are also guaranteeing Christmas delivery for online iPad mini orders. Let us know if your local Apple Store has LTE iPad minis in stock.